Some specific applications: Sand and silt removal or separation, drilling fluids solids removal, catalyst removal and soil washing. 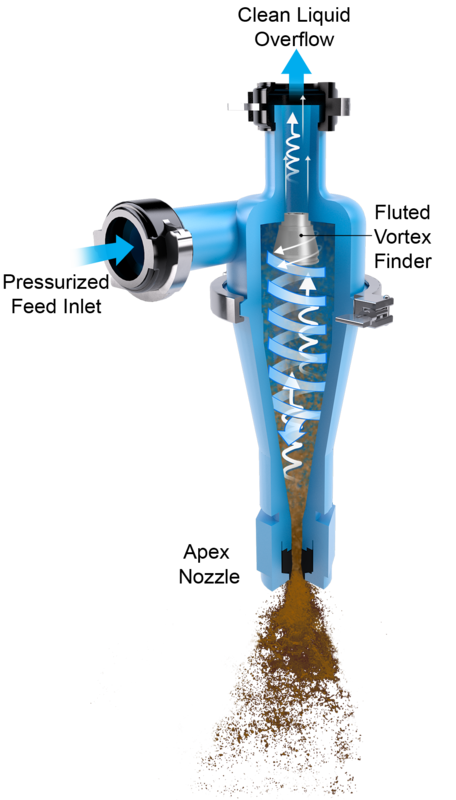 Hydrocyclones use the centrifugal separation principle to remove or classify suspended solids in a slurry. 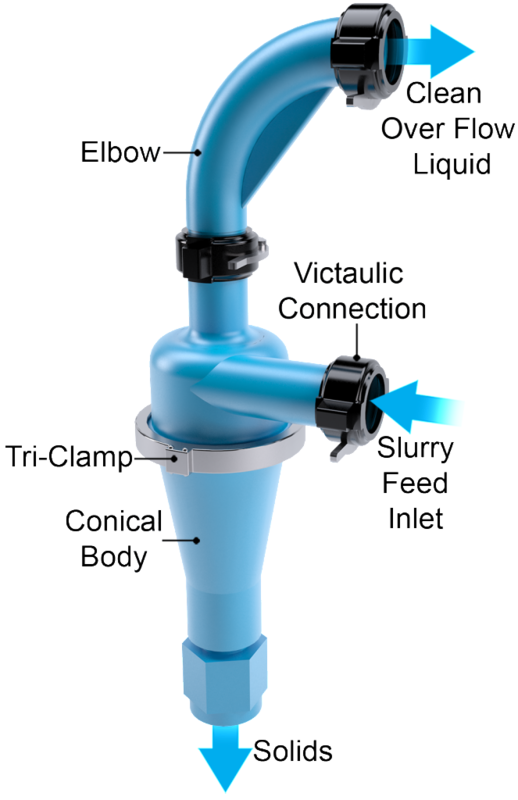 The Volute feed inlet prevents the slurry from circulating back into the path of the incoming slurry, causing undesirable turbulence that reduces separation efficiency. 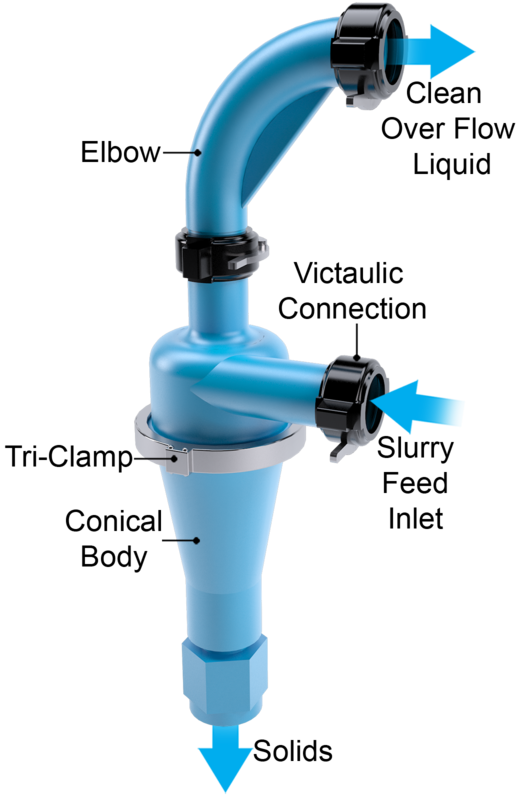 The Fluted Vortex Finder shape increases the momentum as the incoming slurry swirls around the increasing cross-sectional area, causing a more rapid separation of the suspended solids. This also prevents larger particles from “short circuiting” and reporting out the Vortex Finder with the liquid phase and smaller particles. The Non-plugging discharge Apex has a non-circular orifice configuration with a central core and lobes surrounding the central core. As the solids report out the Apex discharge, the surrounding lobes will cause any central core plugging to wash through by producing a differential pressure region. 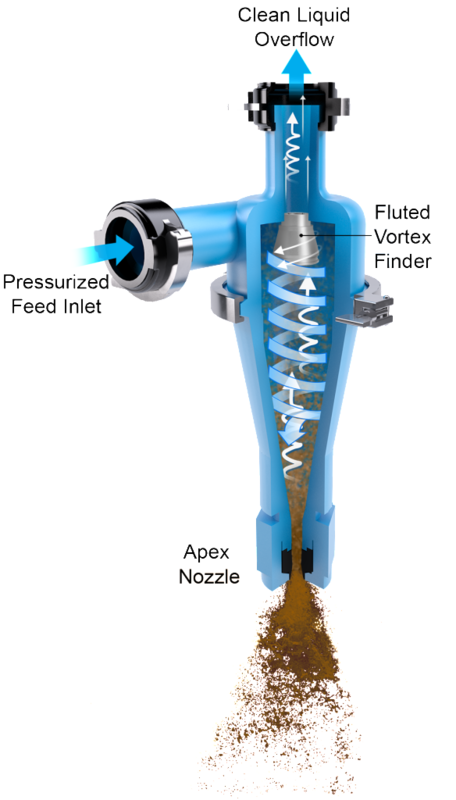 Please contact our sales team to learn more about our VorSpin Hydrocyclones and our Pilot Study Program. the feed inlet at the center. Fig. 2 Illustrates the fluted Vortex Finder. To access our VorSpin Hydcrocyclone Drawings, click here. Please click on the corresponding links below to access a PDF file of our VorSpin Hydrocyclones Performance Charts. To access our VorSpin Hydrocyclone drawings, click here.